At this season’s Fulcrum Coaching and JBV Coaching DC Cyclocross Clinic, Jeremy Powers gave us a box of Cat’s Tongue Towels to hand out as premes and giveaways at Super 8 races. After dutifully giving away the contents of the box I mistakenly believed I hadn’t kept any for myself. As it turns out, I was wrong. In the recesses of my gear bag I just recently pulled out a lone packet. One pre-moistened towel. A survivor. The product promises “to remove grease, grime, sealants, adhesvives, and MORE, safely and naturally.” I believe the fine folks at Cat’s Tongue intended this product to be used for your bike and bike-related muck. Which is cool and all, but to be perfectly honest, I haven’t really ridden in a month so that would be a supreme waste of not only time, but one heroic towel that spent months hidden away at the bottom of a bag. Instead of grabbing the bike, I did the next obvious thing. 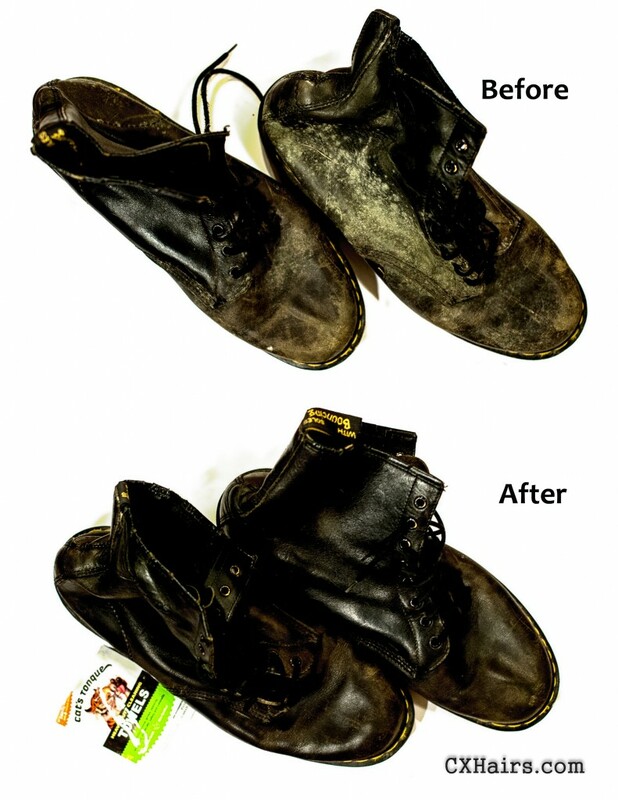 I dug out my decades old Doc Martens boots from a dark, dank corner of my garage. And ladies and gentlemen, they were nasty. Covered with mold and muck. What better way to test the Cat’s Tongue product. The towel is 8 by 12 inches unfolded with a coarse orange appearance. If you rub your finger across it, the towel sort of feels like–wait for it–a cat’s tongue. A cat who has been bathing in citrus and alcohol. The towel also has a hint of aloe that soothes your hands as you clean. Yes, Madge, that’s right, you’re soaking in it. I opened the towel and started wiping down my boots. When it comes to cleaning I have the attention span of Suggs talking to an NME reporter. So it was a good thing it only took about four or five swipes to get my boots in proper rude stomping condition. Good product. Gets stuff clean. Pick some up here: www.catstonguetowels.com. Looks like they are even on sale. And check out these kickin’ boots.